"Respect for nature and for people combined with a relentless pursuit of quality, of authenticity and of integrity in wine making and of audacity in future challenges"
​Bindi Sergardi’s origins can be dated back to 1349. Gentlemen, Nobles full of valor, great agriculturists, captains, and bishops, for 23 generations the family has been dedicated to wine making in Siena. ​The wealth and personality of Niccoluccio Bindi allowed his son Marco to organize an army, which fought victoriously at Lucignano against the Aretines. The valor and the ability displayed by Marco on the battlefield permitted him to be elected to the government of the Republic of Siena. We are in the last years of the fourteenth century, and the family leaves its feudal properties in Rapolano behind and moves to Siena. The Bindi are successful: Giovanni in 1430 is elected to the new government of the Signoria and acquires the status of nobility in Siena. In the mid-1500s Captain Gerolamo Bindi marries Calidonia Sergardi. They have no children of their own, and decide to adopt Ottavio Sergardi, son of Calidonia’s brother. Thus the surname Bindi Sergardi is born. Over the centuries, family members have always continued to invest and dedicate their energies in the cultivation of vines and arable land. Nicolò, 22nd generation of the family and grandson of Elisabetta Bindi Sergardi, has believed strongly in scientific research of new vine clones and in the identification of vocated soils to enlarge and improve the historic patrimony of the family. 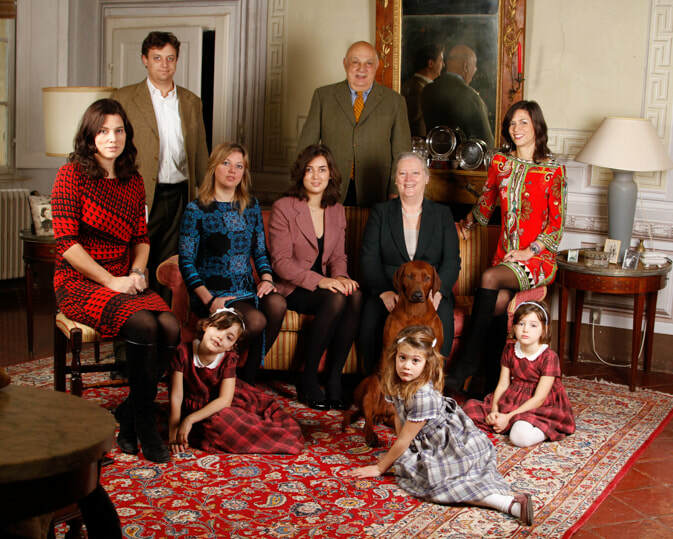 Today, Nicolò’s daughter Alessandra runs the estates of the family. Thanks to her tenacity and courage choices the winery experiences new cellar concepts at the service of quality with a production that is entwined with the authenticity and integrity of its territory. ​The estate is located in the northwest corner of the Comune di Castelnuovo Berardenga, considered the township of production for Sienese Chianti Classico. This area enjoys full light and warmth given by its southern latitude within the appellation.. The peculiar altitude of 1640 feet/500 meters and exceptional galestro and alberese soils, represent the archetype of sangiovese vine's aspirations. Mocenni's vineyards create an amphiteatre with an ideal southern exposure. Continuous research and experiments on new sangiovese clones and cultivation techniques are the foundations of Bindi Sergardi's excellence. Mocenni's origins date back to 1076 when it was a mill. Its name comes from "macina" (millstone). In 1765, in the real estate registry of Granduke Pietro Leopoldo, it was called "Moceni", until today's Mocenni. ​Over the centuries and for 23 generations I Colli has lived the history of the Bindi Sergardi family, who built it at the end of the 1400s. I Colli estate is settled in the northern part of the province of Siena, in the townships of Monteriggioni and Castelnuovo Berardenga. I Colli’s land is characterized by a very particular limestone (sedimentary rocks composed mainly by calcium carbonate), known as “stone of the Montagnola Senese ridge”, worldwide famous also for its precious yellow marble. Thanks to the high presence of stone and an altitude of 1150 feet/350 meters the sangiovese grape expresses here its most fresh and fruity characteristics and ample floral bouquets. I Colli is a hamlet built by the Bindi Sergardi at the end of the 1400s and has accompanied the family over the centuries. It is the most historical estate, passed on for 23 generations. It is positioned on the ancient pilgrim route Via Francigena, running from Canterbury to Rome, a strategic and beautiful location where Bishop Achille Sergardi hosted the legation of Charles V, Holy Roman Emperor (XVI century). ​Marcianella estate lies in the southern part of the province of Siena, in the township of Chiusi. Thanks to a sandy soil and a warm microclimate with higher GDD (growing degree days), the wines have silky and supple texture and the sangiovese expresses here its typical cherry bouquet. As a proof of the excellence of Marcianella’s terroir, the Etruscans, the most ancient population of Tuscany, cultivated vines here from 600 B.C. The members of the noble family Bonci Casuccini, Bindi Sergardi’s ancestors, intrigued by the Etruscan artifacts, became the world’s most important collectors of Etruscan archeological finds. Amongst their students there was Lucien Bonaparte (1775-1840), brother and intelligent counselor of Napoleon. In 1865 the newborn kingdom of Italy bought the huge collection from the family and sent it to the museum Antonio Salinas of Palermo, Sicily as a celebration of the unification of north and south Italy. Elisabetta Bindi Sergardi and her daughter Chiara donated the remains of the collection to the archeological museum of Siena right after the end of the Second World War honoring the birth of the Republic of Italy.